The Belton Fire and Police Departments spread significant Christmas cheer over a span of two days last week thanks to separate programs to assist families and seniors with Christmas gifts. On Saturday, the Belton Fire Corps, the volunteer arm of the Belton FD, wrapped up more than six weeks of work on the Santa Pal program, which assisted more than 128 families with 358 children. Santa Pal is an annual gift giving event where the Belton FD collects and distributes donations to benefit families at Christmas. Starting in early November, the Fire Corps accepted applications from families in need of assistance. From Nov. 1 to through Dec. 16, Fire Corps members volunteered significant hours preparing for this year’s event. On Saturday morning, Dec. 16, their hard work and dedication was rewarded as the bay doors at Fire Station No. 2 were rolled up and a long line of parents in cars picked up toy donations for their children. 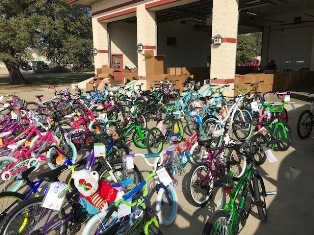 For five hours, 9 a.m. to 2 p.m., the Fire Corps and Belton Firefighters loaded cars and trucks with toys, games, school supplies and more than 60 bicycles. 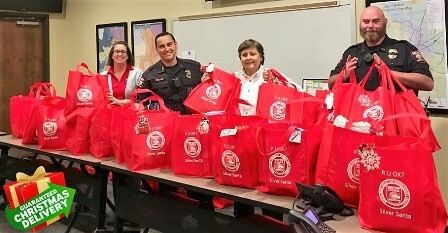 On Friday, Belton PD with significant assistance from its volunteer arm, Citizens Helping In Police Service (CHIPS), provided 133 bags of gifts to area seniors. Silver Santa is an extension of Belton PD's weekly welfare check-in for seniors called R-U-OK?. It is the third year that the Department has distributed gifts to seniors. "There are many programs this time of year that meet the needs of children and families," Chief Gene Ellis said. "Our goal with Silver Santa is to meet the needs of some of the seniors in Belton, many of whom are lonely and could use a lift in the form of gifts to unwrap." Chief Ellis expressed gratitude to those from the public who made donations, his volunteers who selflessly gave of their time, and to his officers who always look forward to giveaway day. In addition, Belton Walmart was a prominent sponsor that helped make the giving possible.